Welcome to the bHome for Fall Tour! 30 bHome bloggers sharing their best for Fall with you. AND – I am showing you my kitchen! Yup, 345 days after we moved in ~ I am ready to show you the “AFTER”! For perspective, I will show you the “before” too. As many of you know, restoring our 1886 home has been a monumental, and really fun, undertaking. Pretty much everything needed major attention ~ especially the kitchen. You can see in the other shots it is white! Cross that off the “to do list”! It is truly with great happiness that I share with you my friends, give one of you a $250 Amazon Gift Card and show you my kitchen!! I made pumpkin bread – have a virtual slice while you look around. Then enter to win and go see the other bHome bloggers homes decked out for fall. Ok, did you see the before? If you did you probably blocked it out. Speaking of “jarring” – let me tell you, that jar of granola you see on the counter below was ALIVE! Every time I came over in the year & 8 months it took for the elderly gent to move out, I swear the contents were in motion. GROSS! And this was neat & tidy. Want to see the video? No moving granola depicted I promise. Warning this video is NOT for the faint of (renovation) heart. This is what the kitchen really looked like not “cleaned up” for an Open House, like in these pictures. There was just a lot of dirty stuff everywhere. Once all that was all gone. Then my stuff – finally!! I LOVE my kitchen and dressed up for fall I think I love it even more, if that is possible. This view is from the back “maid’s” staircase. May as well just call it “my” stairs then! I like to decorate the little spot where the staircase turns to the kitchen. In the summer I had one of my favorite vintage straw bags there. Now one of my galvanized well worn watering cans dressed up for fall. Here is where the stairs meet the kitchen – lots of places to add in a bit of fall. Here you can see the factory metal doors we had made. I love the industrial look of them with the wood clad of the house. I hope you enjoyed seeing my kitchen reveal and fall decor as much as I did sharing it with you. Now as promised the $250 Give Away and an opportunity to pop over to my friends homes to see how they do it up for fall. Linking up at The Creative Gallery . This was a case of seeing beyond the clutter and dirt to the possibilities. You’ve created a lovely kitchen. I did like that curved window over the sink though. It added some extra character. That curved window also spoke to me. I pinned it under “All About Paint”! Kelly, what a beautiful bright white kitchen to enjoy now after all the hard work. Now, I’m not sure I can eat my granola. Ewwwwww! A kitchen to make memories in, it is just beautiful! JOB WELL DONE, MISSION ACCOMPLISHED!!! It is easy to see you put your heart, soul & “rubber gloves” into this project! EEECK!…your kitchen is gorgeous! !…..Yes, what a transformation!…That stove is stealing the show along with those gorgeous countertops and cabinetry….I am so in love with all of your beautiful details throughout the kitchen. You must be so over the moon happy with the results of your kitchen remodel….as it is stunning!!! Great to be a part of the wonderful tour with you! Happy Fall Kelly! I love your home, and I look forward to reading your posts for inspiration. I’d be thrilled to win the gift card for some needed updates in my home. I pinned to my “paint colors” folder. Your kitchen is incredible! Love everything you did! Total transformation!! Gorgeous! Thank you for sharing! I pinned the PaintSaint link. The new kitchen looks great! Oh my! What a treat to open this beautiful post revealing your exquisite kitchen! It is just amazing what you have done in this space! Great job ??? What a beautiful transformation! That is one lucky kitchen that you saw potential. Love all your fall touches, too. You have done such a wonderful job remodeling your kitchen! It looks like such a beautiful, bright, and happy place! I know that you must enjoy it a lot! I hope that you have a wonderful day!!! What a difference! Love all the light and bright and marble. I pinned the paint Saint. Now I just need to convince my hubby to paint our kitchen cabinets! Oh Kelly, you must be pinching yourself every time you walk in your kitchen! It is amazingly beautiful! Well done, sweet friend!!! I LOVE the kitchen! And the fall decor too. Pinned the Paint Saint. I wish I had it while we were painting our house. Thank you Jaime! I am so touched by your comment. As for My Paint Saint – it is not too late. It is for touch up painting – so just pour in your paint colors. And when you need to touch up – the job will be fast, fabulous and with NO brush cleaning! Oh Jamie – even after you finish painting My Paint Saint is a must have. It is really for the aftermath – the dreaded touch up painting. You never have to clean the brush. Just pour in your paint colors, close the lid and when you need to touch up – unscrew the cap, the brush is inside all ready to paint. Put the brush/cap back in/on and seal it up for next time. Brilliant! Good Luck!! From you my dear that is a compliment! Thank you so much!! You know how much I respect you as a designer and keen seer of all things beautiful. Thank you Laurel – you made my day! Thank you Laurel – that means a lot to me coming from you! You know I hold you in the highest regard as a designer. Thx!! Kelly, wow, do I ever love your kitchen! It is so gorgeous, the sink, the light, the beauty, I adore everything. Dressed for fall it’s even better! I love your maid’s stairs….Happy Fall!! MPS image pinned! Your kitchen is beautiful. Thank you for sharing. Good luck Kim & thank you!!! Drool! WOW Kelly you did an amazing job making over that kitchen. I absolutely LOVE your home..every bit of it. Love your fall touches too. I had to go to the website to see what this really is. I was confused as to what it was for. But reading the inventor’s back story was quite interesting on how this product came to be. Thank you for this generous giveaway! Oh I am glad you did Patty! My Paint Saint is truly a brilliant product! I LOVE using mine. Makes touch up painting so quick, easy & painless! Good luck in the give away!! I pinned it on my Helpful Hints board. Your kitchen is truly beautiful! Great – good luck Sunny!! Thank you! Your kitchen is beautiful . Love the fall touches.Thanks for Sharing. Thank you Pamela! Hope you are enjoying some well earned down time now that you have graduated! Congrats again!!! It is very bright Susan – my last kitchen wasn’t so I am so pleased. Good for you pinning & entering. Best of luck! Absolutely stunning! What a transformation my friend! It makes my heart sing to be in there – thanks Christy! Silly how a kitchen can make someone happy – but it is the heart of the home ~ so much more than the sum of its parts. Wow. What a shocking transformation. I can’t believe it’s the same kitchen. Just fabulous. Oh Carol – thank you!! Kelly! What an AMAZING transformation! I did not have a choice… I had to watch the before video. You are crazy brave and a visionary. I respect those traits so much. LOL. Love what you’ve done! Your kitchen is gorgeous! “CRAZY” is right my friend! Thanks for watching the video. I had made it for my cabinet guy – hence the references to Larry! Haha!! Tehn I thought heck, they need to see this. Thank you !! Whoa! What a transformation! I love everything you have done to the kitchen and the fall decorating. Thanks for sharing! Thank you Stephanie! Wonderful to be on tour together – love all your pumpkin ideas! Your kitchen transformation is amazing! I was impressed when I saw the before and after pictures. The change was dramatic! It is gorgeous! I pinned the photo to Amazon Giveaway Board. Thanks. Thank you Laura! You know it has been a LOOONG road to here! What a stunning kitchen Kelly!! Absolutely beautiful! 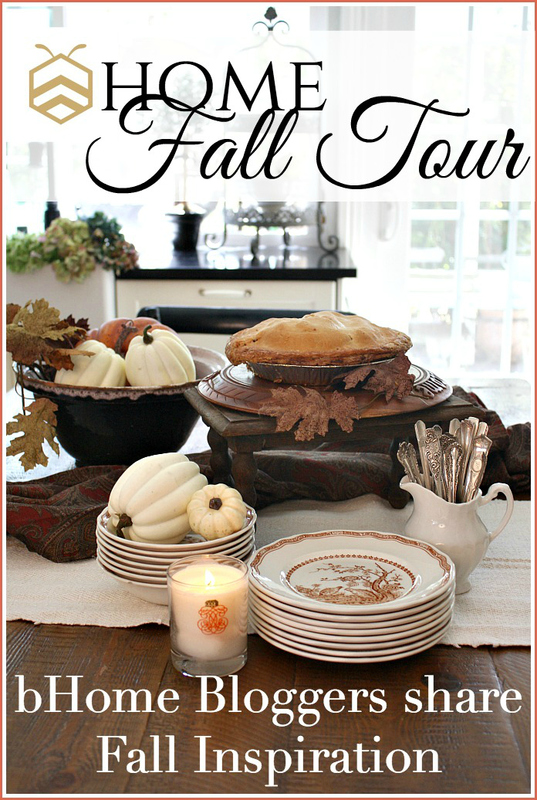 And this bHome Fall tour is wonderful… So many lovely posts to inspire us all! I am all fluttery inside – thank you Cynthia – coming from you that means a great deal to me! Love your Reno! Such a big difference!❤️ Pinned image in my “Paint Me” board! Thank you Linda & good lucK!! Kelly- your kitchen makeover is so beautiful…great job! Having fun on the blog hop this week!! Totally worth waiting 345 days to see the reveal Kelly… your kitchen is stunning!! What a fabulous bHome tour this will be. Pinned the paint touch-up kits and I am loving your kitchen. So beautiful! Your kitchen came out absolutely beautiful! This is particularly resonant for me because I am in the midst of a kitchen reno myself – not quite as ambitious an undertaking as ours was not so old, but nevertheless the dark to light transformation is quite impactful. I’ve selected many of the same finishes – white marble and cabinets – and I just LOVE your faucets and sink hardware! You did a wonderful job!! Love your beautiful kitchen remodel! I particularly like the antique stove in the before picture. It brought memories of my Grandmother’s kitchen which always contained delicious aromas. Thank you for sharing. What a great job. Lovely kitchen. Pinned it under crafts. Love the paint touch up kits. Wish that I had thought of it. https://www.pinterest.com/pin/130111876714388847/ pinned. I would love to try this product. It is a terrific product – order one & see for yourself! You won’t be disappointed! Thanks for coming by! Your kitchen is STUNNING! What an amazing transformation! Your photography is beautiful! Susan – you made my day! Thank you! My dream kitchen too Cindy. I am in dreamland! Finally!! Thx so much & good luck to you. Just pinned MSP to one of my boards. What a great idea! It really is Michele! Try one. I LOVE mine. One for each of my colors & finishes neatly lined up on the shelf for when I need them. Oh, Kelly, your kitchen is absolutely beautiful! Your kitchen is so pretty and looks perfect in those special Fall touches. I pinned MSP. I love it, love it, love it! Well done, my friend! Pinned the Paint Saint. LOVED your new kitchen… All your hard work was worth it! Great before and after pictures! Wow! I am new to your blog via the home tour blog hop, and I just can’t believe the progress you’ve made in just one year! Incredible and very inspiring :)! I entered the contest by pinning the image – thanks for the opportunity! Thank you Hillary and welcome! And oh my gosh wait to you see what else we’ve done in 345 days! Stick around lots more rooms & tour coming! Your kitchen is stunning! You did an absolutely beautiful job renovating it! I especially love the marble, so gorgeous! I pinned in my giveaways folder on pinterest! Thanks for such a generous giveaway opportunity. I am so thrilled to find out about My Paint Saint. A few months ago, I painted my oak cabinets white. I absolutely love the look but hate having to clean the brush for touch ups. I pinned to my decorating folder on pinterest. Awesome Cheryl !! My Paint Saint is a HUGE time saver!! I love everything you did…but THAT STOVE….OMG it is beautiful. Soooo glad you were able to keep it. I’m green with envy. What a wonderful change, and the laundry in the old kitchen too! But old homes have great charm! Good, good job! So happy for your 365 day change! This was the best fall tour ever! I pinned the paint to my DIY board on Pinterest-Melissa Borsey-Thank you. Thank you Melissa! We really appreciate that. I will share your comment with the other bHome bloggers! Good Luck!! Your kitchen is amazing! It is bright and inviting. Wow! Beautiful homes! I enjoyed the fall tour and signed up for more newsletters. My inbox will be full of ideas! Between Pinterest and emails, my to do list will surely grow! I have pinned the My Paint Saint photo/link. This is great timing because we’ve been doing a major facelift on practically the whole house. The kitchen is next. I pinned the link to My Paint Saint — it sounds like it could be a lifesaver! Great job on your kitchen renovation. It looks amazing! I pinned the My Paint Saint to my Pinterest board called “Help for my old House.” It looks as if it could be a great tool to have around. OMG! Your new kitchen is GORGEOUS! What a pleasure it must be to cook in there! I really like the shine from the chandelier & the faucet. I’m also glad you kept (and CLEANED ?) that amazing stove! I pinned it! Thank you so much Diane! I do LOVE my stove. I have some of the original paperwork on it and letters from the CEO to the original owner. I did a post on it – if you have the time you may want to have a look. Right now I am simmering up my first batch of chicken stock on it. Made a yummy sage & lemon stuffed chicken last night & the remaining birds are in the pot now. Have a wonderful day & thanks for coming by!! I love, love, love your kitchen and your stove is fabulous! I’ve been watching the Youtube video’s you posted of the remolding of your home. I would love to have an old home to restore along with a budget to do so. I’ve pinned My Paint Saint and will hopefully use it in a project I have on my to do list. Pinned and happy to have found a new site for inspiration! What a great kitchen! And I am happy to have you Angela!! Thx! Your kitchen is beautiful! What a huge project you took on! Thank you Deborah – huge is right!! Oh my gosh. Hopefully you’ll pop on back here to see more of the “befores” and happliy ever afters! What a fabulous remodel! Wow, I love your new kitchen, it is so bright and beautiful! Thank you so much Janine!! Nice to hear from you here. Pinned the paint to my crafty thoughts board. I LOVE your kitchen redo! We recently went from tired stained cabinets to a nice lighter look. I know that was no small task, but the results are beautiful! Thank you so much Jan. Nothing about this house restoration has been a “small task”, but we are loving it! I pinned the Paint Saint under “Paint Effects” and thank you for the opportunity to win! Beautiful job on the renovation! Can you tell me what your countertops are? Thank you so much! My countertops are Carrara Marble. I have a few posts on them. Glad you have you visiting My Soulful Home! Love your home!! Congrats on a wonderful job. I pinned My Paint Saint and plan to buy a few. Thank you so much Karyn! And you will LOVE My Paint Saint. I swear I was just using one of mine today! Nice spy on the milk jug Laura! Unfortunately that left with the old gent! Thank you regarding my kitchen! Pinned it! I am a “newbie” and LOVE what I see…looking forward to getting lots of decorating ideas. You have fantastic vision to see past the junk and clutter and all the brown to bring that gorgeous kitchen to life. May I ask what the wall color is? It looks so dreamy on your walls. Thank you Mary! My wall color is Simply White by Ben Moore. I adore this white! Seeing what a truly beautiful transformation you have done give me hope for my house. You are a gifted decorator, Kelly. Thank you for the inspiring tour. Beautiful job. Now the kitchen fits the rest of the home. Pinned it! Beautiful kitchen remodel! Unbelievable transformation! So beautiful!!! I pinned My Paint Saints. I ordered them when you talked about them on a podcast. What a great product. LOVE the podcast. What great vision you had! It is beautiful! A LOBOR of love I’m sure. Thank you Nancy – indeed it was – IS!